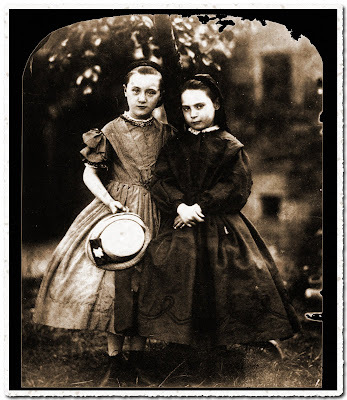 Daguerreotypes and tintypes were among the first photographs, developed towards the end of the 1830s. I love these photos because they give me a sense of the world as it was long ago and at the same time they are very modern. I look at the faces of the people and can imagine that they are here today; wearing the clothes we wear today doing the things we do. Old photos are wonderful. Always makes me a tad bit sad though when I see stacks of anonymous family memories for sale in antique stores. Are you familiar with the Shorpy photoblog? High quality images from the past. It's really addictive. I see what you mean! Thanks Kathryn! You're absolutely right Emily. They're people, just like us. I'm currently reading "Mr. Lincoln's Cameraman" by Roy Meredith and it's incredible how even seemingly bland photos (by today's standards) have great stories behind them. For example Thomas Benton, a hot-tempered politician (it says he killed a man in a duel), was getting his photo taken when the skylight shade fell on his head. Brady came running in when Benton yelled "Brady, come here at once!" and found his head sticking through it. And Benton just laughed it off. I mean it sounds like a cartoon and this happened just minutes before the taking of the professional photo that who knows how many people have seen. The more I learn about the history of these people the more I love it.